Senate., Western Connecticut State University. Faculty. 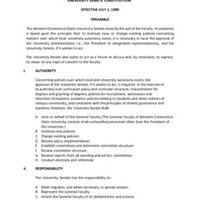 “WCSU Senate Constitution and Bylaws.” Western Connecticut State University Governance. University Senate Records, RG 3.8. WCSU Archives, 14 July 2017. Accessed on the Web: 19 Apr. 2019.